It'll almost certainly be slower, and RAM doesn't work nearly as well if it's in uneven amounts (like one 16GB stick and one 4GB stick). I'd actually advise 2 sticks of 8GB RAM, as it means it's spread across 2 connections with the CPU, which means it can access and utilise the RAM better than if it was one single stick of 16GB. RAM is sold in kits for a reason, they need to be same voltage etc. to work best. With new motherboards and chipsets it's probably less of a problem as it was years ago. But still, buy a kit of RAM and don't mix and match RAM - it's always been a good idea to buy in kits. Any advice on this guy's? Good enough - yes. It's not great though. Could someone tell me how that compares to a 1050/1060 please? Also, I just popped into Curry’s and all of the potential choices, including thr Surface Book 2 has the same issue of colour trailing. Does anyone know of any 2 in 1s with a refresh rate higher that 60hz? Higher than 60hz? There isn't one at the moment, to my knowledge. As for the performance of the Pro WX Vega M GL, it's somewhere between the 1050 and 1050Ti graphics cards, so not bad. I don’t understand why they are suffering colour trailing, only thing I can think of is that it’s to do with the 4K panels, perhaps a standard FHD would be better for the issue? That's all I can think of too. I imagine those cards/CPUs trying to deal with a 4k display wouldn't work spectacularly for games. This is considered a “workstation” so I’m not sure how that affects anything, but how do you think this would deal with FM? That would be the configuration I’d go for if I were to purchase. The money you're spending is crazy for a tablet like computer and I honestly think you're better off getting a very high end slim laptop. However, it's your choice. I'd wait if I was you - the new laptops coming out in 2019 are insane! The money isn’t the deciding factor for me, simply, does it do what I want. I did look at the Acer Predator Triton 900, not only is it extremely expensive, but will be very heavy to hold in hand at that size. What are your thoughts on the above device with the HD panel, do you think that’ll run FM well with no colour trailing? The money isn’t the deciding factor for me, simply, does it do what I want. I did look at the Acer Predator Triton﻿ 900, not only is it extremely expensive, but will be very heavy to hold in hand at that size. Fair enough - I do think this year will have a few nice new laptops on the market - and tablet devices - so if you can hold off you may get a newer spec machine than what's out there at the moment. Some serious work going into mobile computers this year, so might be worth a bit of a wait. Excellent processor and a dedicated graphics card similar to a 1050. The only stumbling block may be the weight...? It’s an Ultra HD screen which I’m now trying to steer clear of, trying to go for a FHD to prevent any colour trailing. Was also hoping for 16GB of RAM. 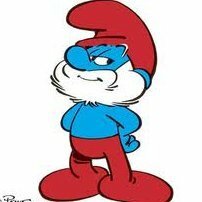 Hello Smurf or anyone that could help.. 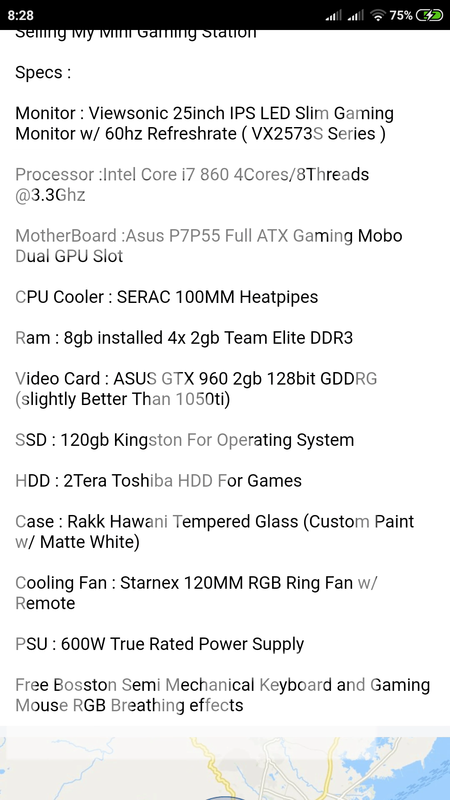 Looking for a new laptop just for playing FM and general internet browsing/streaming. 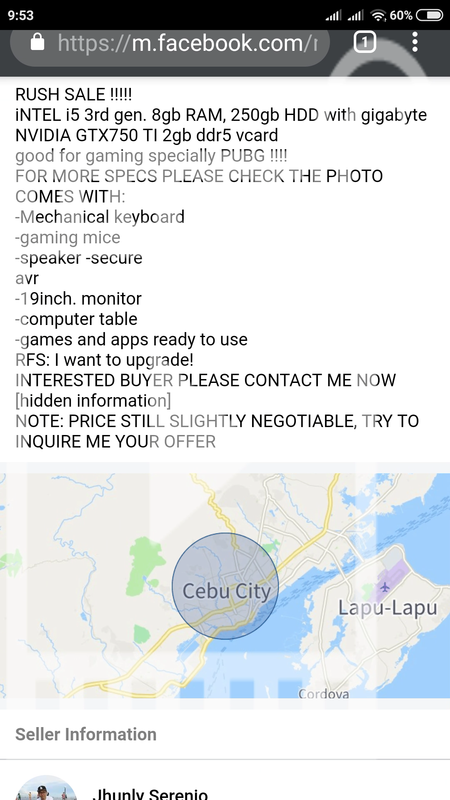 I've seen this and I'm just wondering if it is a good deal or if there is better out there for the money? Thanks for the quick reply.. Pretty sure this is the same laptop. I tend to run around 5 playable leagues and a few view-only ones too. 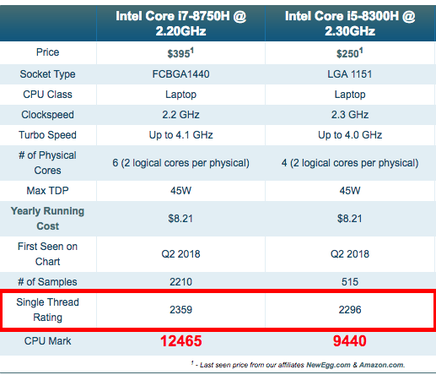 Looks to be around the same as a 3rd generation processor of intel range - which puts in the bracket of performance from about 5 years ago - even though it was released in 2017/2018 and is only about a year old - the performance of this processor is not great at all compared to processors released around the same date. Annoyingly it is out of stock, but I'm struggling to see anything comparable for the same price. I do not really want to spend more than £800, is there anything out there comparable? The next version up is in stock but the only difference I can see is 1050 ti graphics card, rather than 1050. It's £100 more, so is the difference really worth it? ﻿ Annoyingly it is out of stock, but I'm struggling to see anything comparable for the same price. I do not really want to spend more than £800, is there anything out there comparable? Thank you. Says 'pre-order' so assume it has the same issue regarding stock. The impression I got from Laptops direct is that it may be some time before they have the stock, so looking at alternatives. What is the difference between the two graphic cards? I could be persuaded to go to £900 but not sure if it's worth it or if I should remain patient! 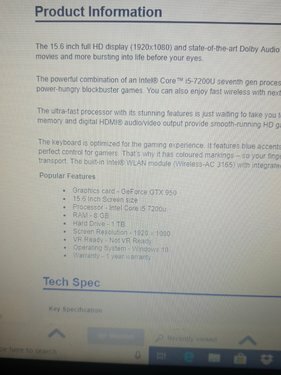 My Laptop has these specs-Was wondering if anyone can tell me how well FM19 will run!!!! Not great - is that the budget? It will run it - but best to keep on small/medium database with leagues loaded to a minimum, maybe 3-8 leagues. Graphics on low settings. You can always download the demo and try it - but the demo only allows 1 leauge loaded and 6 months of in-game play - so not really a tester for the system. What u mean graphics on low setting? Can I only see guys from leagues I have or?? Nah, it just means you won't see all crowd, stadium environment, sky details - not really important stuff. Is there a big difference between NVIDIA GeForce GTX 1050 and the 1060/1070/1080 series? Because the price is big between 1050 and the other ones. 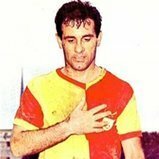 I'm looking for a laptop to play FM 2019 and many editions after. Processor I7 - 8th gen.
1050 standard and dif between 1060 is significant. Gets better higher up. 1050 2gb is good for fm. 1050 4gb is better. 1060 3gb better again. 1060 6gb better again. 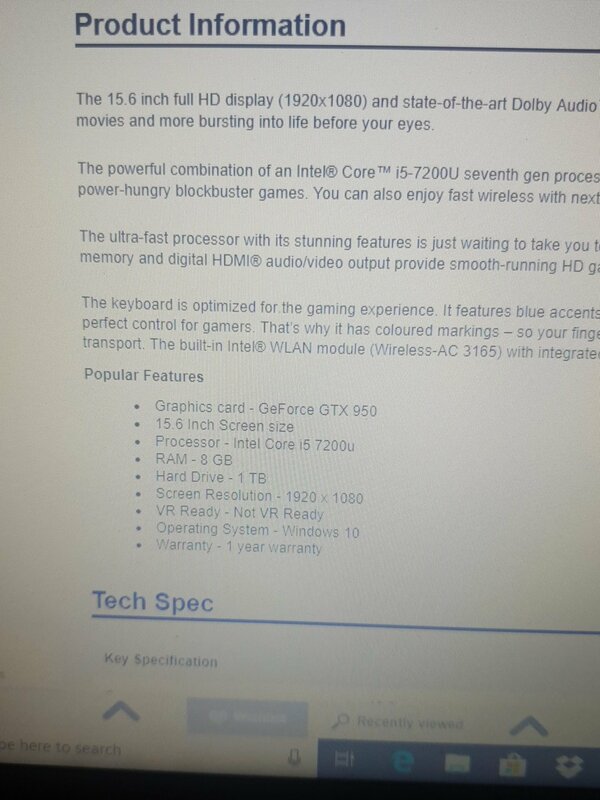 Looking at buying this laptop and can see processor is listed as 376 on the list on opening page. I didn't know how that would fare, graphics are not too important for me and I don't run big games normally. It will run - but how well is anyone's guess. How much? What's the budget? Well I was looking at new but my budget is too small for the laptop I want. This laptop is £125 second hand. The laptop will only be used for FM so don't necessarily want a massive payout. I think that's the best you can do. Can anyone tell me if this can run smoothly? Well, the processors in those are between 7 and 10 years old, so honestly, I wouldn't go for either of them, as even if they do run FM, they won't do it spectacularly well. The second one doesn't even give the model of the processor, which makes it hard to say if it's good enough, and the first one has the 10 year old processor in it. Will this one be any better then? Aye, that'd do a half decent job, much better than the previous two. Not a top of the line processor, but certainly not a bad one at all, and the rest of it isn't bad either. That'll run FM19 absolutely fine. Hi @Smurf - I'm looking to get a new laptop, budget is around £800. Would mostly be used for FM, but also CK2, watching films and internet. 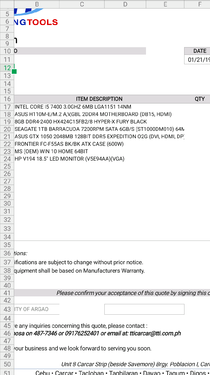 I've been looking at the Vyper from PC Specialist, is that any good? Also wondered if it'd be worth upgrading the processor to the i7 or spending extra on the RAM for what I want it to do? Processor - the better is obviously what you want to go for. FM is largely still single core processing, so having more cores/threads is not really an advantage, surprisingly the i5 8300H and the i7 8750H have similar single core/thread performance. But you should definitely get the best processor you can afford - which is the i7 in this case - or something else with a higher rating the Single Core Performance. Graphics: 1050 2gb is probably the min I would recommend. Thanks @Smurf, much appreciated - looking again at the site, I've seen the Comsos VII. If I upgrade the processor on that to the i7, the RAM to 8GB, and the graphics card to the GTX1050, do you think that will do the trick then? Also, I notice with the RAM that I can have either 1x8GB, or 2x4GB - I think I read elsewhere that 2x4GB is better, is that right? My key reason for purchasing the laptop are to play Football Manager, with portability (Max 13 inch screen and around 1.5kg) and long battery life, as I would like to play off charge most of the time. I seem to therefore be looking towards something like an XPS/Macbook 13" with integrated graphics UHD Graphics 620 and a 8th gen i5/7 u series quad core processor (as these tend to have the better battery life), I completely understand that will mean low-medium graphics on 3D, but are you able to recommend anything else that would do me few years playing FM please. Thing is, if you have 1x 8 gb stick of ram and the ram fails (which can happen) your computer is just dead. If you have 2 x 4 gb RAM and one stick fails, your computer will still run on 1 x 4gb RAM. The advantage also being it's cheaper to replace 1 x 4 gb ram stick, than replacing a 1 x 8 gb ram stick (the price is different). 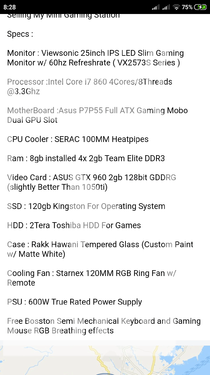 A few reasons to go with 2x4gb ram sticks, which would be my preference. No, barely make a difference at all. More ram is better though. 16gb is the max I would go, don't really need to go any higher at the moment. I seem to therefore be looking towards something like an XPS/Macbook 13" with integrated graphics UHD Graphics 620, I completely understand that will mean low-medium graphics on 3D, but are you able to recommend anything else that would do me few years playing FM please. Anyone got any experience with Huawei's Matebook X Pro? Looks like a great alternative to Apple. Curious to know if anyone has played FM on a Huawei laptop as I've had a lot of issues on a Dell laptop with a 4K screen, and the Matebook X Pro has a 3K screen. Are the latest Macbook Pro lines good enough? What issues have you had? As I’ve also recently experienced issues with Football Manager on a 4K screen on thr Dell XPS?